No resistance. 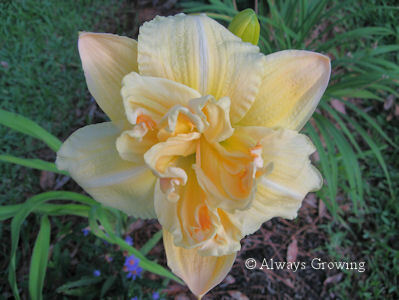 Recently, I have found that when it comes to daylilies, I have no resistance. If I see one in bloom, I succumb and have to have it. Last Friday, my number 1 sister and I went shopping. Of course, that included plant nurseries. Even though it was blisteringly hot, we trudged through aisle after aisle finding a few plants that we just had to have. Having decided to plant more blooming perennials, and having such good luck with daylilies, as soon as I saw these blooming beauties, I quickly scooped them up. (Remember after having purchased so many mislabeled plants, I now only buy those that have an open flower.) All the ones I purchased had many unopened buds which would mean I would enjoy a few flowers this year. 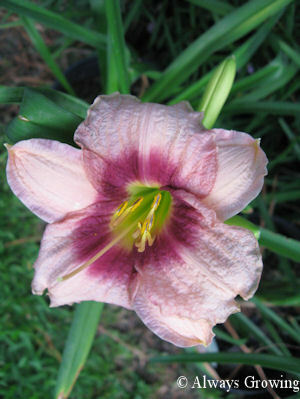 The first one is Elizabeth Salter, a lovely rose-colored daylily. 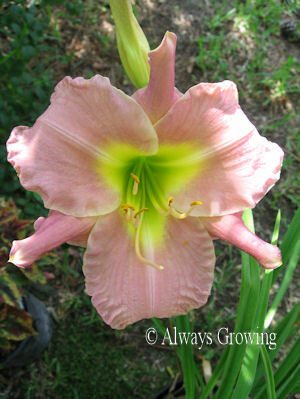 Chicago Apache, a lovely red daylily, found its way into my entry garden. The next three had were unlabeled, so I don’t know the names, but that doesn’t matter, they will still add color to the pink garden area. 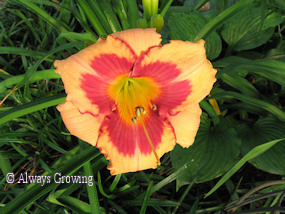 Having daylilies that bloom at different times, makes giving up the annuals I used to plant easy to do. Resisting the impulse to buy more pretty daylilies seems to be impossible. 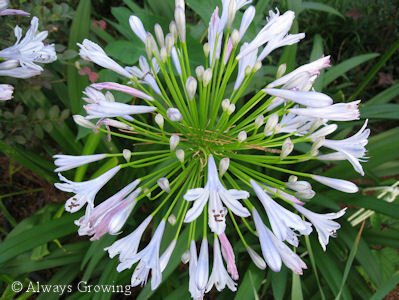 This past winter, my agapanthus foliage was frozen back. This was the first time that this has ever happened. 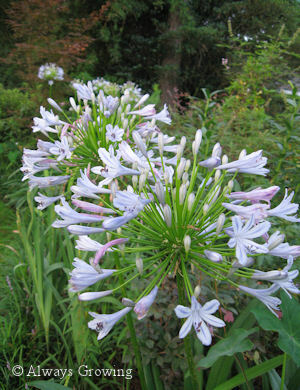 Usually, the agapanthus comes through the winter just fine in my zone 8 garden. In late January, when I saw the dead foliage, I was panicked. I was afraid there would be no blooms this summer. Fortunately, several readers told me not to worry that theirs freezes back and still blooms. I shouldn’t have worried; mine are blooming like normal. With everything so topsy-turvey around here (i.e. oil spill), it is so nice to have some things that are normal. More changing flower color. 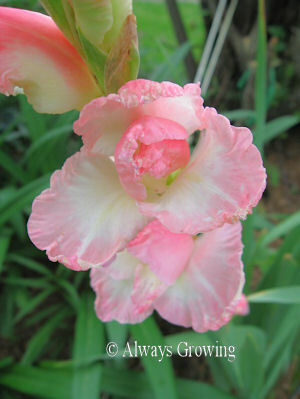 As I mentioned in my last posting, gladiolus that I planted about five years ago have gradually changed color. The first year they bloomed, the flowers were yellow with just a hint of a peach color. Unfortunately, I don’t have any photos of those flowers on my computer, so you will just have to take my word for this. Year by year, the yellow shrank, and the peach took over. As more of the peach showed, it seemed to get darker until now when the flower is now a deep orange with just a little bit of yellow in the throat. When I bought these the package showed these corms to be yellow, and the first year, I was very disappointed that they were not all yellow, but I could live with the small amount of peach. 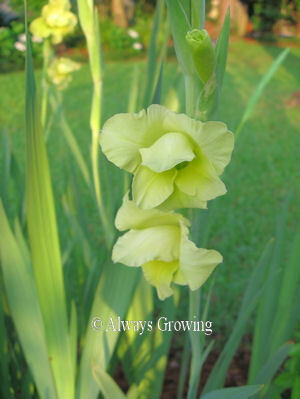 Later on, I planted, in the same area, all yellow gladiolus which do bloom just before these. So I do have my yellow glads. I really did not like these orange gladiolus at first, but they have grown on me. Of course, that may have something to do with several neighbors telling me how beautiful they are. (There is nothing like seeing something through another’s eyes to make us appreciate what we have.) 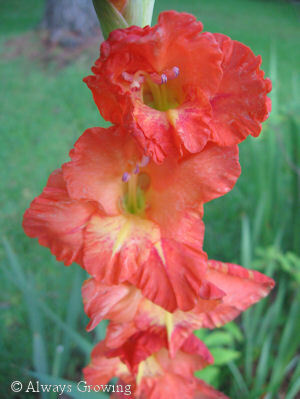 Still, I am puzzled as to why these gladiolus flowers gradually changed from yellow to orange. There are a few plants that have flowers that have changed color as they have settled in my garden. 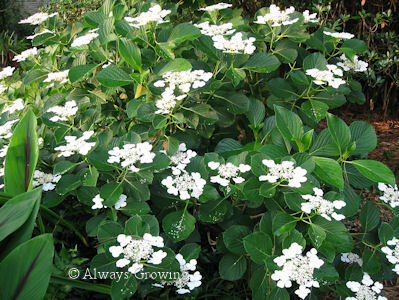 Now, I am not talking about hydrangeas, but other flowers that are not known for changing color. 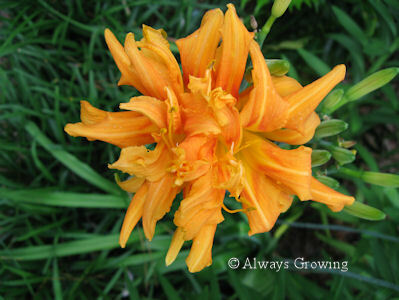 One of the most striking is a gladiolus that started out yellow with a little orange tinge and is now orange with just a small yellow throat. (It was supposed to be an all yellow glad.) But, others have changed colors, too. Today, my Catherine Woodbury started blooming. While it is a lovely flower, it is not the lavender-pink it is supposed to be. It is really more a pale, creamy yellow with pink undertones. When this was first planted, the blooms were a very pale lavender-pink, but instead of getting darker, it seems to be getting paler. Strange. I guess it must have something to do with the soil. This is not the first time this has happened. 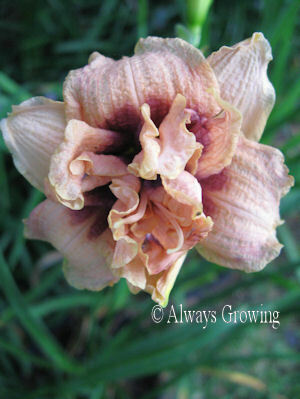 When I first planted some daylilies from my mother, they were a dark bronze color. In subsequent years, they have changed to a dark red. Maybe it has to do with fertilizing, the ph of our water, or ??? Anyway, I wish Catherine Woodbury would revert to the correct color. Have any of you had the same experience with flowers changing colors as this one has done? 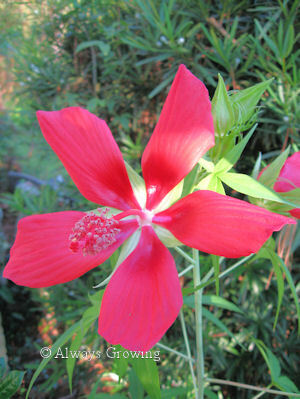 Hibiscus coccineus is commonly called “Texas Star”, and it certainly is a star in the summer garden. I have grown this plant for at least ten years, and every summer it puts out the most gorgeous red flowers. 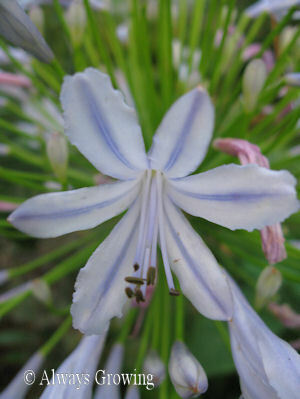 This perennial dies back in the late fall, but reliably returns each spring. It is easy to propagate from seeds, and grows just about anywhere. In fact, my original plant is practically in shade the whole day but it still puts out blooms. Speaking of the blooms, these are such a wonderful crimson color, a true red, not an orange-red, and the flowers are large – six to eight inches across. Just like the tropical hibiscus plants, the flowers only last one day, but there are always new ones that will open all summer long. These plants are slender, tall, about five to six feet, and are perfect for the back of the border where the flowers really grab your attention. They are supposed to be hardy to zone 7, and I think this native North American plant would be a great addition to anyone’s garden. 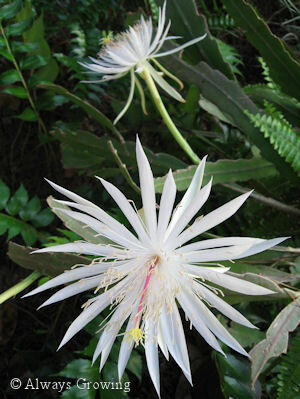 After missing two bloom periods, I finally got to see my night blooming cereus, but to do so, I had to move the plant to the entry garden. Usually, this night bloomer is situated on the north side of the house. This way, because the sun does not hit the flowers until after 9 AM, I can enjoy their beauty without having to stay up until after 11 PM when they first open. With the longer days, the flowers don’t open until very late when I am usually asleep. Since I am up and out in the garden early, I can see the flowers before they fade. Unfortunately, I missed two bloom cycles by not checking on this plant early enough. Hence, the moving of the plant to where I couldn’t miss it. I don’t know what is happening to me, but I am starting to miss a lot of flowers when they first show up. 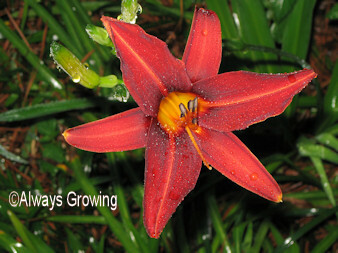 Yesterday, I missed the first of the Texas Star flowers, and I have missed a few daylilies’ first flowers, too. I don’t know if I am just not as observant as I used to be, too busy, or if there is now too many plants in the garden for me to keep track of. Either way, I am certainly glad I didn’t miss seeing this unusual night blooming flower. 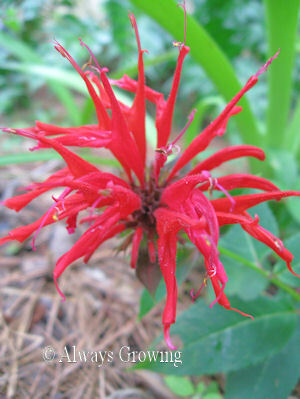 With apologies to Katerine Paterson, the Jacob I love is the monarda (bee balm) Jacob Cline. It has just started putting out blooms, and the red flowers are blending in so well with the other flowers in the entry garden. I just added this to the garden last spring where it did very well for its first year. This past winter, it was knocked back a bit so there is not as many flowers yet. I am hoping that it will recover this summer and spread more. This variety is supposed to be more mildew resistant, and so far, I have had no problems with mildew, and I garden in the hot, humid South. It is the large, scarlet flowers that I love. 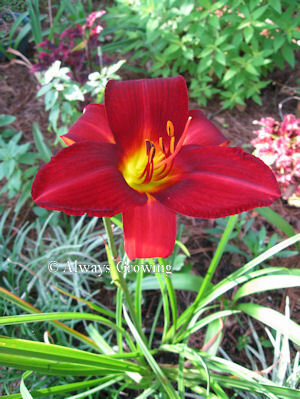 The color is just so pretty and blends in well with the red daylilies I have recently planted in the entry garden. The fact that these big, red flowers attract hummingbirds, butterflies, and bees is an added bonus. When I decided to plant more perennials, I certainly am glad that I found Jacob Cline. I love frilly flowers. Occasionally, the simple flower form does appeal to me, but in general it is the double, frilly, full flowers that I can’t get enough of. Two double daylilies just started blooming. The first is Vanilla Fluff. See for yourself. Isn’t it gorgeous? 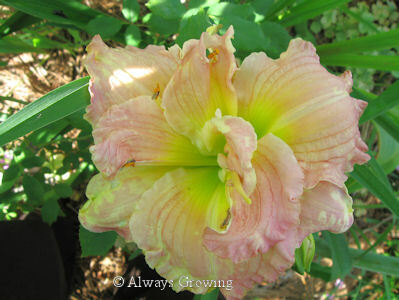 I purchased this particular daylily at a garden show in the fall of 2008. The only thing I had to go on was a photo. I don’t think that photo did this flower justice. Otherwise, I would have bought more than two. The next double is the old fashioned orange. My Number 1 sister gave this to me last year after she received it from my mother’s neighbor. It is very vigorous. This is only the second year it has been in my garden, and already it has multiplied nicely. I don’t usually like orange flowers, but I am finding that the color is starting to grow on me. Without realizing it I have added more orange to the garden. It is funny how our tastes can change. My color preferences may change, but I don’t think my love of double flowers ever will. When my number 1 sister and I went out last Thursday, our first stop was a nursery we had never been to before. 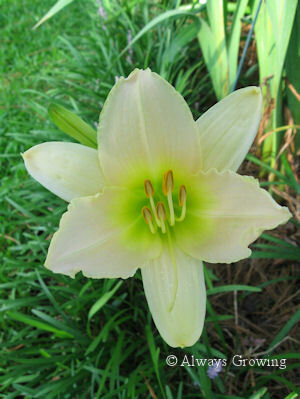 As soon as we saw the daylilies blooming, we couldn’t resist buying some to add to our collection. I picked out a lovely lavender-pink one called Lavender Girl. 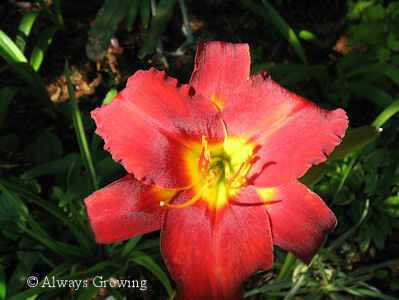 I also had to have another red daylily. 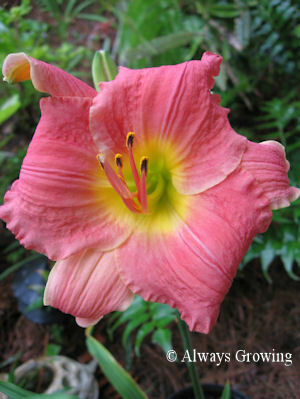 The tag simply read “Red Daylily, hybrid”. 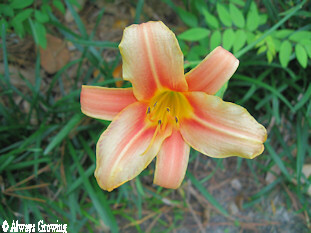 Both of these daylilies are repeat bloomers and had at least three fans. Since I have had so many disappointments with mislabled plants, I now buy only when plants are in bloom so I can be sure of what I am getting. Since these were the only ones in bloom that day, I just may have to stop by this week to see if any of the others that had blooms are now open. Since I am planting more and more perennials in my garden, these newbies fit right in.